The Colonial Marines are a privately financed strike force owned by the Weyland-Yutani Corporation and hired out to various governments of Earth and its colonies as need, and funds, demand. Generally the troops have a short life expectancy once on operations and are often under trained to save money and meet management targets. But, hyped up on a heady mix of Colonial Marine esprit de corps and armed with copious amounts of hi-tech (and often experimental) weaponry, the average Marine grunt seems happy in his work so long as he's not expected to think much and has something to shoot at. Once things begin to go wrong however the Marines have shown themselves in the past to be a fragile asset, often disintegrating under the pressures of poor command and failing morale. 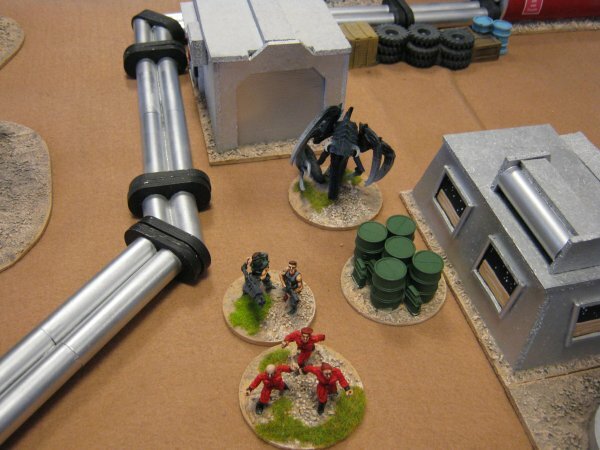 One detachment of robot gun drones (4 dice).These are deployed by a Marine squad as guard units (this counts as a move action). The guns may not move for the rest of the game once deployed. Robot guns have a high rate of accurate fire but limited ammo. 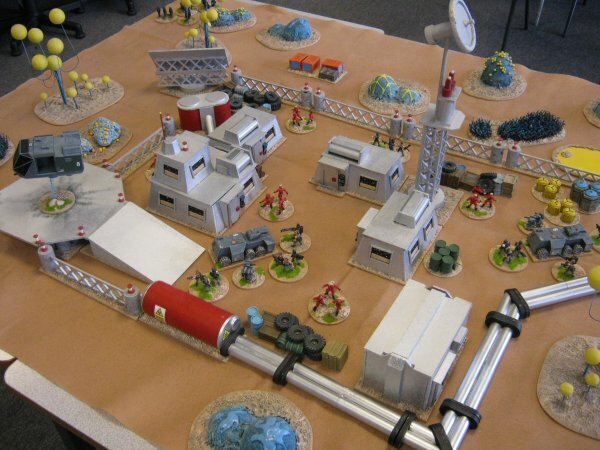 Robot guns may not be used for shooting in the Marine player's go, they are purely a reactive fire asset. They may ignore the first 'no fire result' they roll in each opponent's activation. A robot gun that rolls three 1s when shooting is out of ammo and immediately removed from the table even if this was its first attempt at shooting (damn those useless REMFs who were supposed to restock the magazines!). Robot gun shooting is not blocked by smoke and they ignore pinned results. 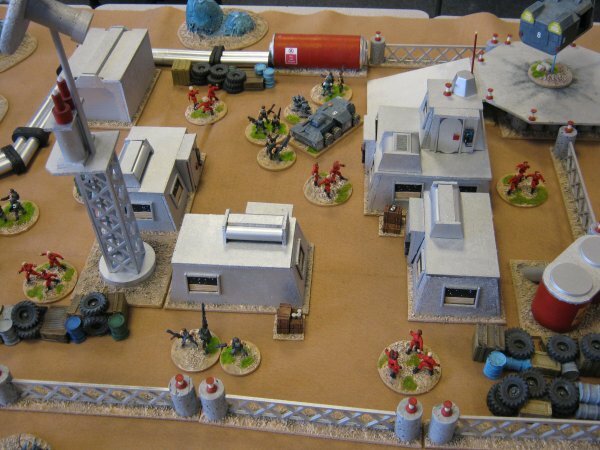 A suppressed gun cannot rally itself it must be repaired by a Marine squad moving adjacent to it and making a successful rally roll (5+ with no bonuses). Failing to repair the guns will lose the initiative but further attempts can be made just like a normal rally roll. Robot guns that are contacted by an unsuppressed enemy squad are immediately destroyed and removed from play. Each platoon is transported in a wheeled IFV (Interior Fighting Vehicles) which is a low profiled armoured vehicle designed for travelling inside complexes or tunnels. 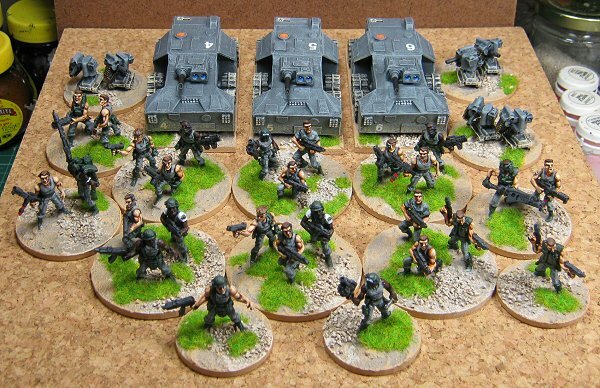 Each IFV is armed with a turret mounted heavy machine gun (4 dice). Senior command are seldom deployed with the troops preferring to direct the battle from a distance via an (unreliable) internal communication net. Company commanders rely on voice reports from their platoon commanders and video feeds from the troop helmet cameras for their information. Occasionally the Marines may have access to a troop lander for insertion or extraction. More often than not this vehicle is used to keep the Company Commander and his staff away from immediate danger. 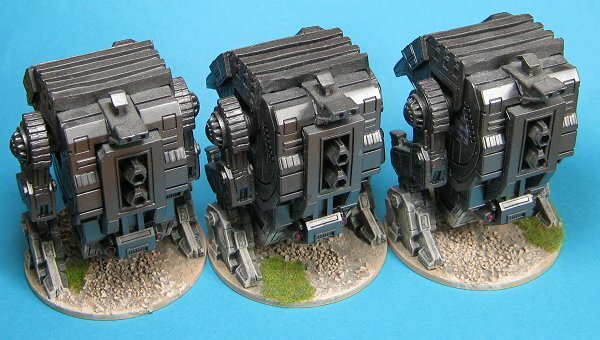 Troop landers are armed with a single Heavy Machine gun (4 dice) but may also have door gunners (4 dice each). After a particularly disastrous mission on LV-426 the Colonial Marines decided, prompted by the one success of the mission, to deploy armoured walker units with some forces. 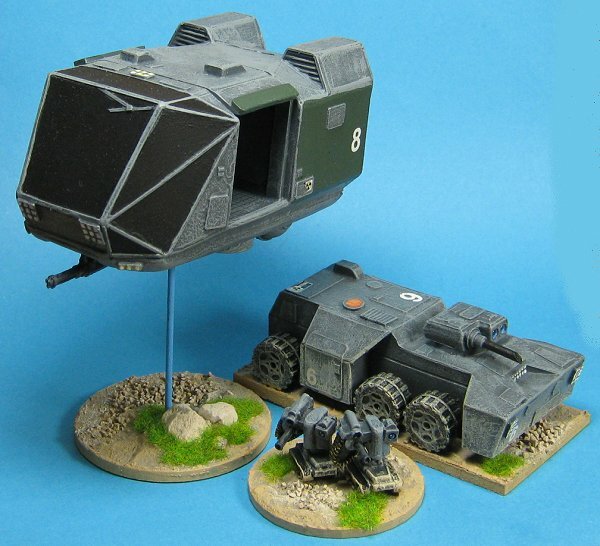 These units, based on a modified cargo loader design and designated Rapid Placement Landers (RPL, referred to as 'Ripleys' by the troops), are dropped from orbit to land under their own power and used to prepare and protect landing zones for the rest of the platoon. Each RPL is armed with a heavy machine gun and a flame thrower (4 dice combined) and is heavily armoured to protect its single pilot. Colonial Marines are at best Regulars (4+ Pin, 5+ Suppressed) and are often Green (5+ Pin, 6 Suppressed). 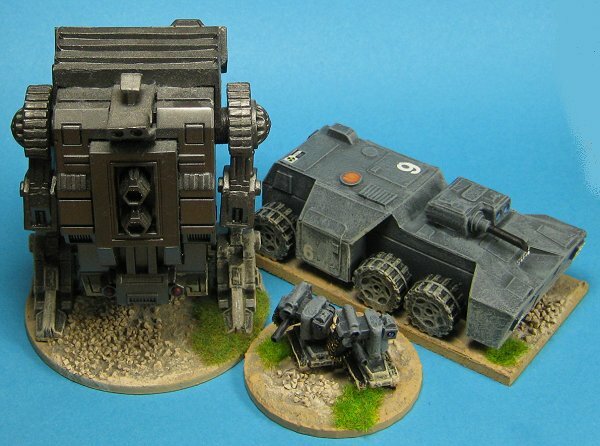 The Colonal marines are from Scotia Grendel, the IFVs and lander come from Daemonscape, the robot guns are from Black Cat Bases and the Ripleys are Star Wars Telosian Tank Droids. This is a fairly standard scenario involving these two forces. 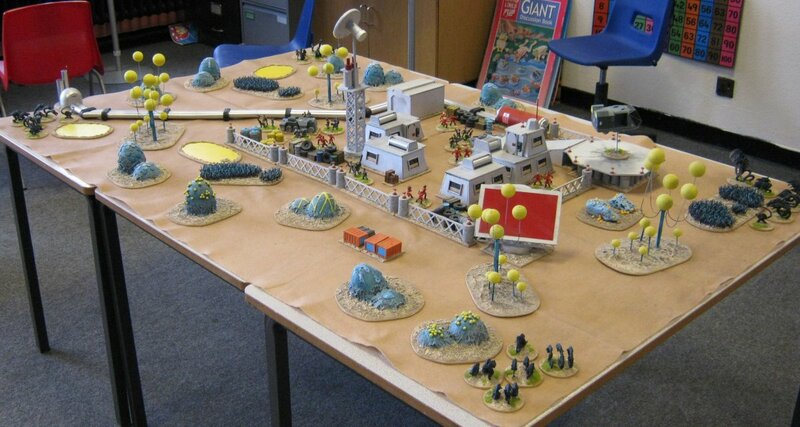 The board is laid out with a human colony in the centre and some suitable covering terrain around it. The human payer starts in the colony complex with five bases of colonists and two standard platoons of Colonial marines. The Xenomorph player has a group of warriors at each table corner and the queen to bring on later if needed. The human player needs to evacuate the colonists. Colonists cannot move unless accompanied by a stand of Marines (not just an officer) and may not occupy the Marines' vehicles (there's too many of them to fit). Once a group of colonists reach the landing pad the human player may choose to call the lander and evacuate them. The lander can only evacuate one stand of colonists at a time and it may not be called if any Xenomorphs are occupying the landing pad. Summoning the lander automatically rescues a group of colonists but passes the initiative to the Xenomorphs. The Xenomorphs win if they kill a majority of the colonists. The Marines win if they rescue a majority of the colonists or kill the Xenomorph Queen. 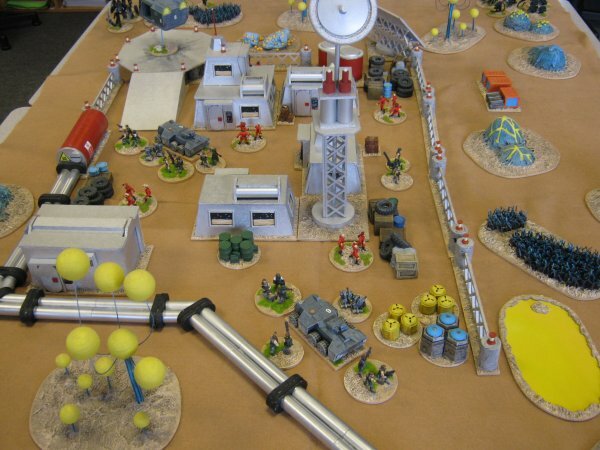 The play through of this scenario shown here is a game I put on for my school wargames club at the end of the summer term 2011. ​The students had two games, playing in teams of three to a side. In game one the Xenomorphs stormed into the colony via an unprotected section of the perimeter and won a fairly simple victory. 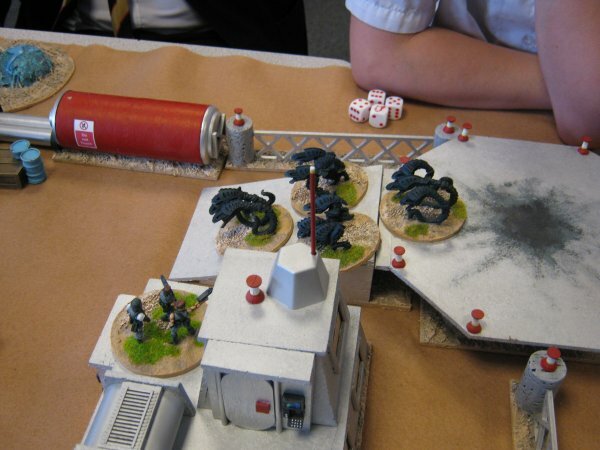 In the second game, with the roles reversed the Xenomorphs had only killed a single base of colonists but had reduced the Marines to a support stand and an IFV. They were poised to wipe these out and then win comfortably by rounding up all the remaining colonists but they insisted in bringing on their Queen for the grand finale. The lone Marine support stand tore her to bits with sustained fire and snatched victory from the jaws of defeat.